We are looking for the craziest driver! Are you such a guy? Then use the arrow keys and move as far as possible! Are you ready for such a cool challenging game? Then this is your chance! Do not slip it! Enjoy the landscape and try to reach the main goal. Speed, drugs and rock-n-roll! 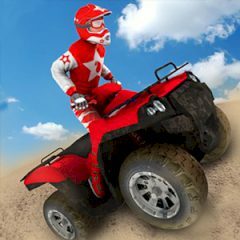 So, in general, overcome obstacles and heavy terrain is more difficult on ATV than on common bike. That is why you must be ready, that not every ride will end happily. By the way, sometimes you just end with wheels up and head down, it happens. Anyway, the important is stand up again and try overcome the road section for a second time. They are separated into twenty individual levels. Well, can you overcome them all? You can try it yourself, or wait for some opponents in mode and have so much fun here!